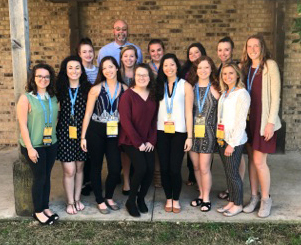 Students and their advisotr, Dr. Mark Crider, recently attended the NSNA annual meeting. The convention theme was "Think Big: Nursing on a Global Scale." The keynote address was given by Dr. Mary Wakefield, Ph.D., RN, FAAN, immediate previous U.S. Deputy Secretary of the Department of Health and Human Services. She addressed the global influence of individual nurses and national and international nursing organizations in addressing global public health issues. She shared the significant role of nursing organizations in addressing the Ebola and zeka public health concerns. As such she articulated the significant role our nursing organizations play in the health of our global community! She also shared her experience of how a nursing student from a rural North Dakota community can become interested in public policy and achieve the position of second in command of the health services of the U.S. government. Her message was powerful in articulating the role of nursing in global health concerns, and I am grateful our students were able to hear her address. The students also presented a resolution titled "In Support of Education about Antimicrobial Resistance and Antimicrobial Stewardship Programs." The was one of 56 resolutions presented and it passed! Congratulations! Become involved in a professional student-run nursing organization. Become friends with other classmates and upperclassmen, plus get the inside scoop on professors, clinicals, and classes. Participate in community service and social events, fundraisers, and state/national conventions. Learn how state and national student organizations work. Hear interesting speakers talk about professional opportunities for graduate nurses. Assume leadership positions at the local, state and national levels. Gain opportunities to receive SNAP and NSNA scholarships and recognition. Enhance your resume’ through membership in a professional nursing organization. Be mentored by upperclass students and become a mentor to upcoming students. Be recognized as a student leader in the School of Nursing.